The Large Magellanic Cloud (LMC) is a nearby irregular galaxy, and a satellite of the Milky Way. At a distance of slightly less than 50 kiloparsecs (≈160,000 light-years), the LMC is the third closest galaxy to the Milky Way, with the Sagittarius Dwarf Spheroidal (~ 16 kiloparsecs) and Canis Major Dwarf Galaxy (~ 12.9 kiloparsecs) lying closer to the center of the Milky Way. It has a mass equivalent to approximately 10 billion times the mass of our Sun (1010 solar masses), making it roughly 1/100 as massive as the Milky Way, and a diameter of about 14,000 light-years (~ 4.3 kpc). The LMC is the fourth largest galaxy in the Local Group, after the Andromeda Galaxy (M31), our own Milky Way Galaxy, and the Triangulum Galaxy (M33). 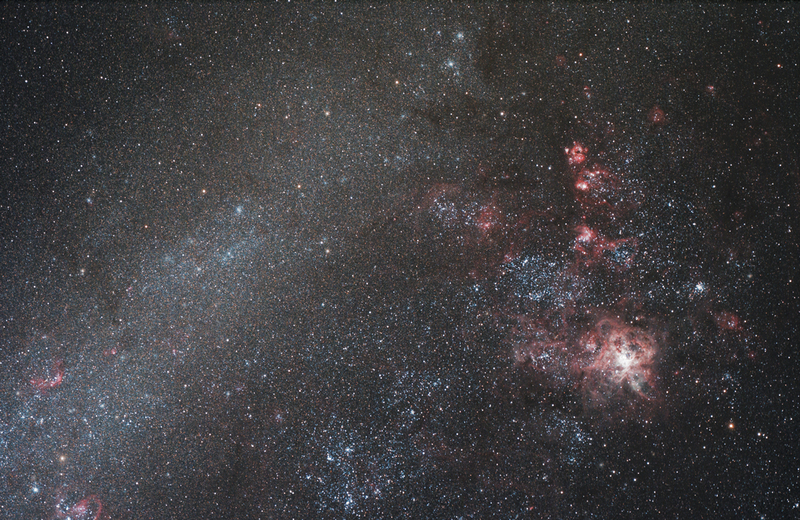 This was the first time we shot the Large Magellanic clouds and the superb Tarantula Nebula. More depth we expect to achieve with the H36 version.